You now have reams of information: your skills, interests, values, personality characteristics, and information about jobs and/or job industries that interest you. If this information seems unrelated, it’s not! In Step 2, you started—at least in your mind—to consider how information about yourself and the world of work fit together. Step 3 will formalize the process of“matching”, or synthesizing the information you’ve gathered. This comparison will enable you to evaluate which jobs are the best fit and hold the most potential for you. In addition, Step 3 will identify any education and training gaps you have that would keep you from pursuing the occupations you investigated in Step 2. Chances are the matching process will produce more than one possibility for you. Other factors, such as the amount of education necessary and whether you need to earn a living right away, will help you determine your choice among the possibilities. Once you select an area, you can chart your employment path. Do you need more education or training? Are you qualified to do that type of work now? If so, a job search is your next step. Doing a SWOT Analysis requires you to analyze all you’ve learned. Your experience with completing assessments, compiling information for your Career Planning Folder, and investigating the world of work should have given you an idea of what type of job to seek. The SWOT Analysis and Gap Analysis will help you decide if this is the work for you. In addition to the information gathered from Steps 1 and 2, the SWOT Analysis and Gap Analysis will be used in creating your Career Action Plan. Creating a Career Action Plan will be explained further in Step 4. 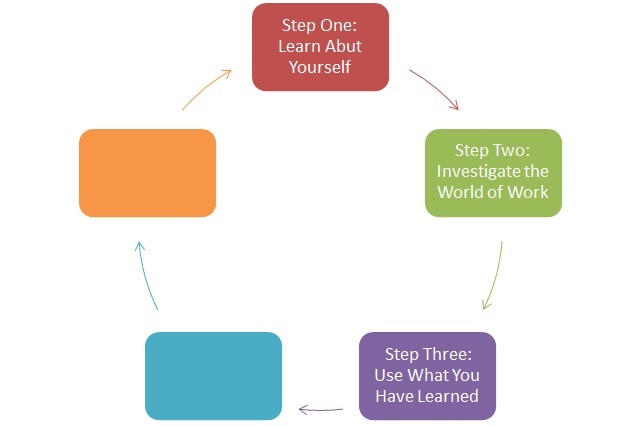 Completing Steps 1 and 2 assisted you in self-exploration, and investigating the world of work. Step 3 provides information on where you can go to acquire additional education and/or training experience. In addition, you will find an Exercise 7 titled: “Financial Needs Assessment,” which identifies the amount of money you will need to live comfortably. Numerous educational and training opportunities are available to young people. Programs range in length, location, cost, size, eligibility requirements, and career focus. Interested students should be resourceful and creative in discovering information. Search the Internet, skim the Yellow Pages, visit career centers, network with family and friends, and seek assistance of school counselors, career counselors, mentors, and teachers. California Career Technical Education – Career Technical Education (CTE) is a program of study that involves a multi-year sequence of courses that integrates core academic knowledge with technical and occupational knowledge to provide students with a pathway to post secondary education and careers. California high schools have developed CTE programs,some may include only a few CTE courses, while others may include Career pathways and/or Academies. Career Pathways typically are organized around broad industry areas such as health, media, or science and engineering. They combine rigorous academics with real world applications so that learning is more relevant to everyday life and future careers. Academic classes are combined with classes that focus on occupational skill development. Programs emphasize learning in the community and the workplace through work-based learning internships, job shadow experiences, meeting with career mentors, etc. Living Within Your Means – “Living within our means” is a goal we all should strive to achieve. It is absolutely vital when you’re between jobs and don’t have much savings to tide you over. It means spending only what you have to and saving up to buy items you can’t currently afford. It means relying on loans only to pay large-ticket items, such as a house or car. It means paying credit card bills in full each month. If you haven’t been living this way, now’s the time to start. When you’re job hunting, you curb your spending!